With Mysteryland coming up very quickly, I thought I would help everyone out that is attending the festival! Now, I know I have never attended a camping festival before and Mysteryland knows that I am not the only one. 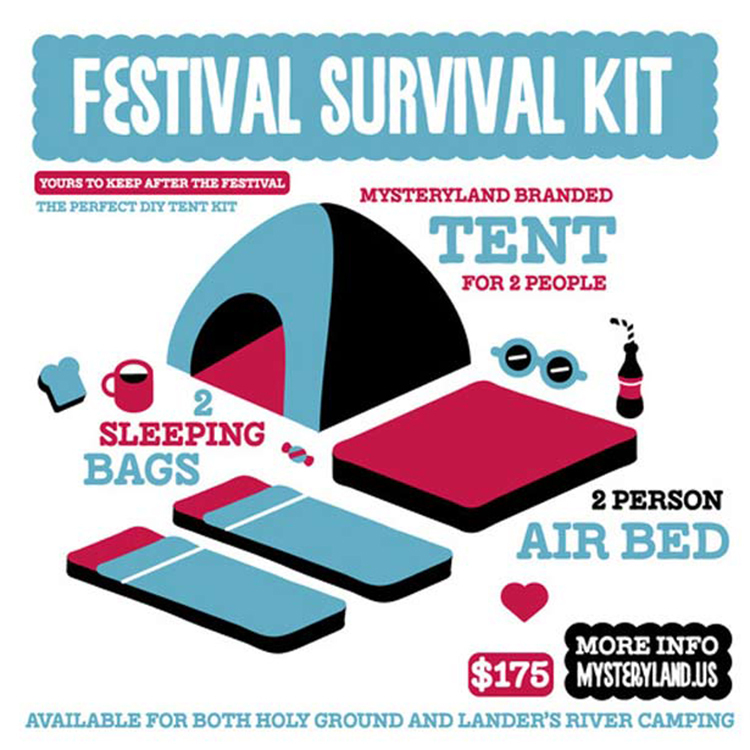 They have come up with the Festival Survival Kit. It is the perfect do it yourself kit that will be available for wherever you’re camping at – Holy Ground Camping or Lander’s river Camping. Plus, you are welcomed to keep it forever! They also have Prrrly Bird Lockers which will allow you to keep your stuff safe as well as be an area where you can charge your phone! These will be located in the Holy Grounds campsite. For those like me that aren’t sure how you are going to get to Mysteryland and back, they also have a transportation service. Those travelling by car are required to have a parking pass before they enter the festival grounds. Holy Grounds camping parking, weekend parking and day parking are available for purchase here. Round trip daily shuttles are offered both Saturday, May 24 and Sunday, May 25 departing from New York City’s Grand Central Station, New Jersey’s Newark Airport, and Downtown Philadelphia. Tickets and more info. Shuttle service will be offered Friday, May 23 through Monday, May 26 for campers. Schedule and additional information coming soon.